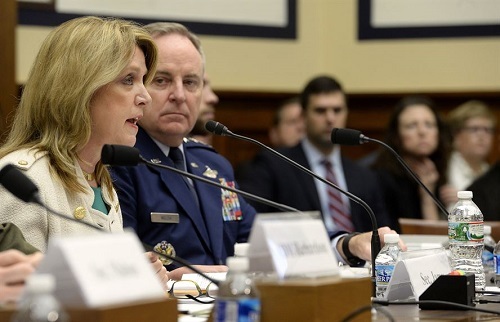 MARCH 17, 2016, WASHINGTON (AFNS) – The military services’ secretaries and chiefs presented their respective branch’s fiscal year 2017 budget plan March 16 on Capitol Hill. 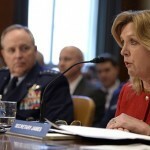 Air Force Secretary Deborah Lee James and Air Force Chief of Staff Gen. Mark A. Welsh III testified on the Air Force’s fiscal 2017 national defense authorization budget request, and explained how it directly supports the branch’s top three priorities. James went on to say that since last year, more than 55,000 sorties have been flown in support of Operation Inherent Resolve, while adversaries have conducted illegal weapons testing and rocket launches. She also addressed growing threats in both space and cyberspace. “The Air Force is fully engaged in every region of the world, in every mission area and across the full spectrum of military operations,” James said. “Plainly, in my opinion, we’ve never been busier on such a sustained, global basis. And we are doing all this with 200,000 fewer people and 79 fewer fighter squadrons than we had at the time of Operation Desert Storm. A balance of capacity, capability and readiness was required in the fiscal 2017 budget submission in order to successfully confront current challenges, she said. The Air Force made “tough” choices when it submitted this year’s budget, including the deferral of five F-35 Lightning IIs and three C-130J Super Hercules aircraft, as well as some upgrades to some missile warning and radio systems and infrastructure improvements. According to the budget proposal, more growth will be needed in fiscal 2017, specifically in critical career fields such as intelligence, surveillance and reconnaissance, cyber, maintenance and battlefield Airmen. To meet present mission requirements, Guard and Reserve personnel are performing more cyber, ISR, command and control, mobility and space missions. “I plan to take a judicious approach to incrementally increase our total force beyond the current level, provided we can attract the right talent,” James said. In response to world changes, both James and Welsh agreed adjustments must be made, to include re-phasing of the A-10 Thunderbolt II and EC-130H Compass Call retirements, and being able to provide the combatant commander’s number one demand of the Air Force — ISR. In terms of readiness, the service aims to fund flying hours to the maximum executable level, invest in weapons system sustainment and ensure combat exercises like Red and Green Flag remain strong. Additionally, the Air Force’s senior leaders seek to modernize the force with ongoing investments in support of nuclear deterrence, space and cyberspace priorities. Welsh also testified that all three legs of the nuclear triad — strategic bombers, intercontinental ballistic missiles and submarine-launched ballistic missiles — remain vital to national security.